Close-up of flower and seedpod. 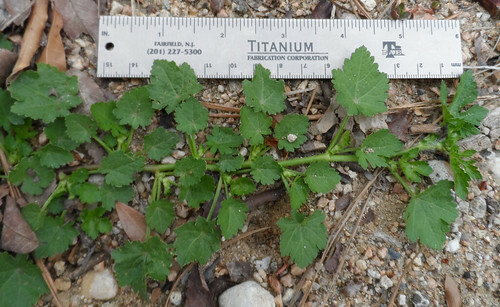 Surface portion of Carolina Bristle Mallow plus long runner. 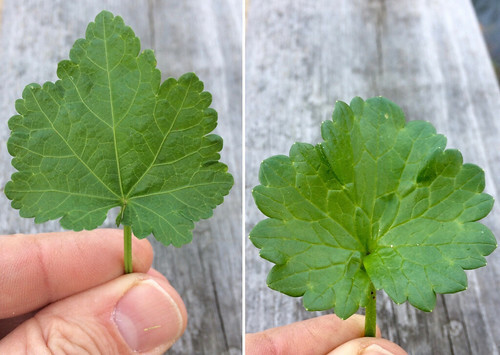 Younger Carolina Bristle Mallow leaves are more deeply cleft/lobed than mature leaves. 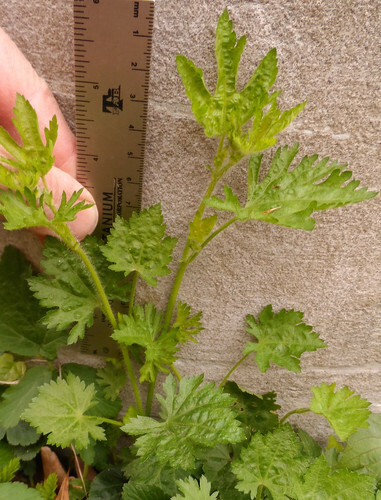 The leaves feel coarse and the stem is hairy. 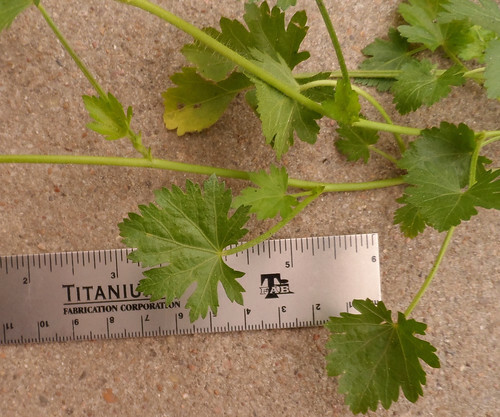 The stem/runners of Carolina Bristle Mallow put down roots where it touches soil. 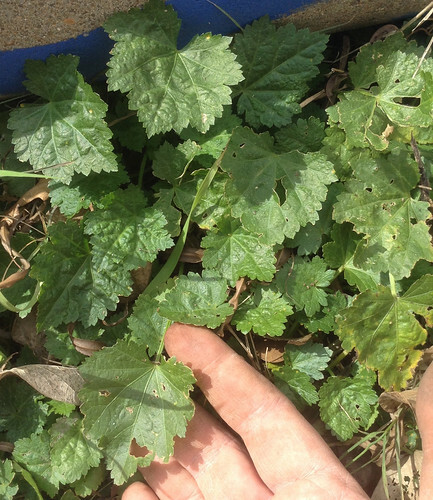 Creeping through the grass of unkempt yards and just about anywhere else where other plant life doesn't tower over it, Carolina Bristle Mallow is found all over Texas...or at least anywhere there's enough rainfall to support grass. 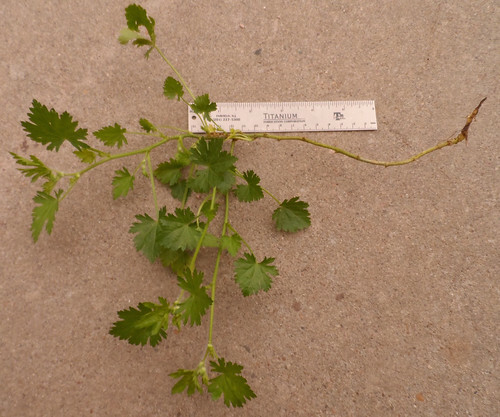 The plant looks and feels unappealing, with it's coarse, scratchy leaves and stiff, hairy stem. 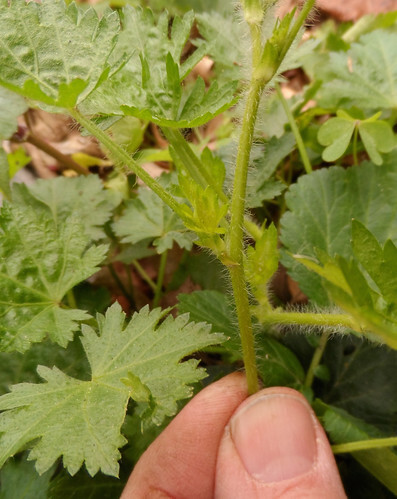 While this plant looks a bit like the highly nutritious Malva neglecta, Carolina Bristle Mallow is unrelated and doesn't have a similar high vitamin, mineral, and protein content. 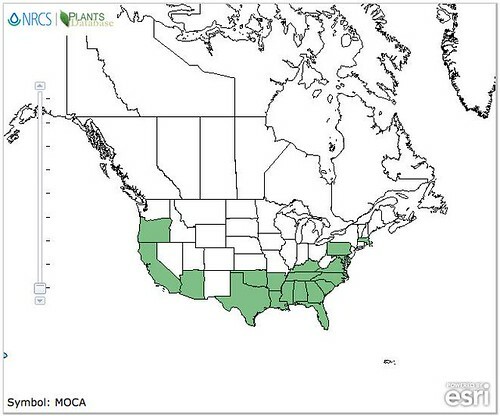 In fact, it's not even in the Malvaceae family but rather the lone member of it's own unique genus, Modiola. 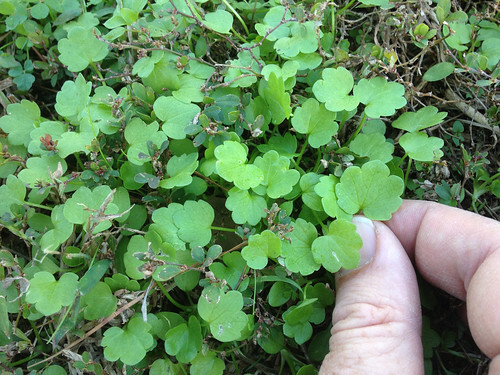 It's not a plant one adds to salads nor is there any record of anyone cooking it. It's only common use is to make a refreshing cold tea by soaking the shredded leaves in water for a couple of hours, staining, then serving over ice. 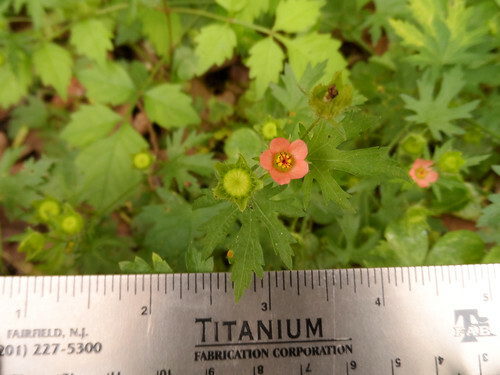 Don't mistake young, toxic Creeping Buttercup (Ranunculus repens) for Carolina Bristle Mallow. 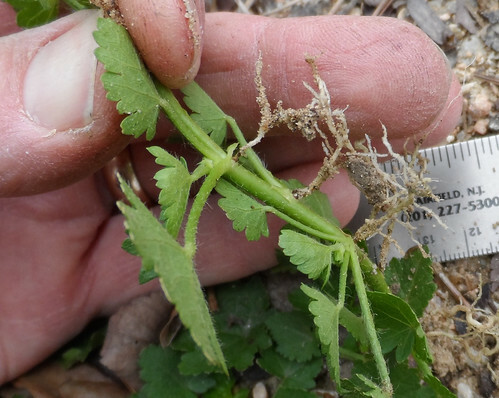 Creeping Buttercup leaves have deeper clefts and a shinier, light-green color growing up from a single taproot. 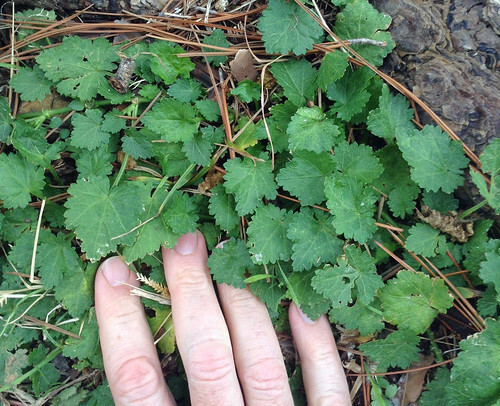 Remember, Carolina Bristle Mallow puts roots down anywhere its stems touch soil. If you aren't sure what you have, wait a few weeks to see how the plant grows. 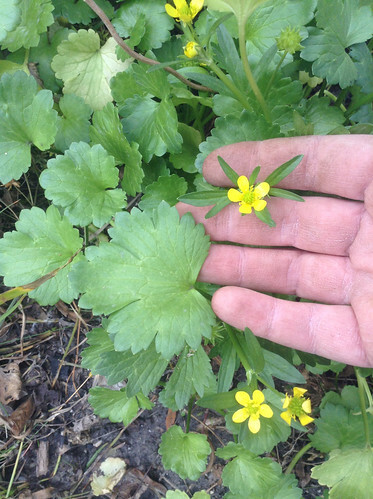 If it develops yellow flowers and sharply cleft leaves it's the toxic Creeping Buttercup. 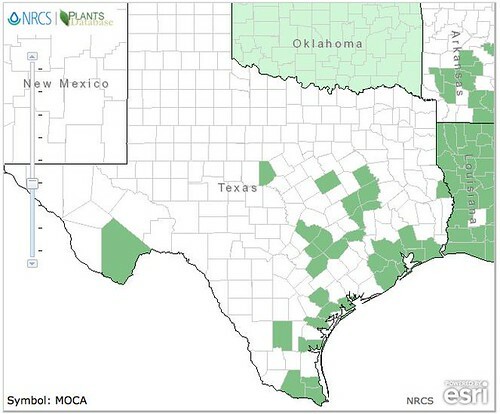 Carolina Bristle Mallow on the left. Creeping Buttercup on the right.